METAIRIE, La. 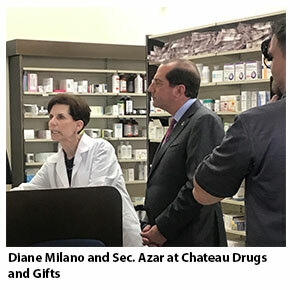 (Feb. 7, 2019) — U.S. Department of Health and Human Services Secretary Alex Azar yesterday visited Chateau Drugs and Gifts in Metairie, La., which is owned by National Community Pharmacists Association members Kerry and Diane Milano, both of whom are registered pharmacists. Azar made the visit to help highlight efforts by the Trump administration to lower prescription drug prices. Among topics discussed were the 2018 laws to ban so-called "gag clauses" that prohibited pharmacists from disclosing more affordable prescription drug options to patients, the recently-proposed policies to end retroactive pharmacy direct and indirect remuneration fees, and the proposal to exclude from the discount safe harbor the rebates paid by manufacturers to plan sponsors under Medicare Part D and Medicaid managed care organizations. Also present for Azar's visit were a number of other community pharmacists and patients from the New Orleans area. This is Azar's second official visit to a community pharmacy within the last four months. "As it is, there are such challenges with PBMs and reimbursement that I as a community pharmacy owner often make more on votive candles than on some prescriptions," said Chateau pharmacy's Diane Milano. "We are so grateful that the administration is working hard to change this system for small business pharmacy owners and for the patients we are dedicated to serving. It was an honor to host Secretary Azar at Chateau Drugs and Gifts and show him a little bit of the work we do here for those in our community." NCPA CEO B. Douglas Hoey, pharmacist, MBA said, "At NCPA our members' interests align with Secretary Azar's and the HHS team's in many areas, and we have appreciated the opportunity to collaborate on ways to lower prescription drug costs and provide relief from the tactics by PBM middlemen that contribute to higher drug prices. Passage of legislation banning contractual 'gag clauses' was a good first step toward transparency and lower prices, and the administration's recent proposal to eliminate retroactive pharmacy DIR fees is another step in the right direction. We hope the proposal will be finalized swiftly to help patients save money and provide more certainty to small business community pharmacies. Our thanks to Secretary Azar for continuing to visit community pharmacies and providing opportunities for America's most accessible health care providers to offer their perspectives on how they can serve their patients and help bring down costs."